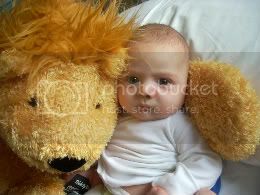 Luca Gregory Vassallo was born December 19, 2007. Several weeks after being home with Mommy and Daddy, Luca developed what seemed to be an infection on his nose. Luca was at the hospital for two weeks with no signs of improvement. They knew something was not right. On March 7th, 2008 they were given the heartbreaking news that Luca had a form of leukemia, called Acute Myelogenous Leukemia. Childhood Acute Myelogenous Leukemia (AML) is a type of cancer in which the bone marrow makes a large number of abnormal blood cells. According to Luca’s doctors at Memorial Sloan-Kettering Cancer Center in New York City, AML is quite rare in infants who are Luca’s age. Less than 20 infants in the U.S. per year are diagnosed with AML. Luca is now in the Pediatric unit at Sloan-Kettering Cancer Center undergoing Chemotherapy. He has made many new friends at Sloan-Kettering, where doctors and nurses are working around the clock to ensure Luca’s recovery. Greg, Manal and Luca have a long road ahead of them. We are hopeful and confident that Luca will reach a full recovery, and will be back home soon. Luca you are so cute. Happy 1st birthday luca.you are always in my prayers. hello ! mommy and daddy ,luca. i just wanted to say how wonderful you all are. I so enjoy watching luca when i pass by his room. I start jumping up and down to get his attendion. he such a big boy siting on his bed. my prayers are with luca and all of you everyday.forward with the future .with god! leading the way! god bless. Hi~ I am not sure if you remember me~ I was the youngest of the sisters you met last Friday night in the family room at Sloan. I just want you to know that you, your sisters, Luca and your husband have remained in my thoughts everyday sice we met. I pray for Luca everyday and have shared his story and asked others to pray. My mother always says that she has a "direct line to God" and Luca is in her prayers. I will continue to follow your journey and I hope that we can meet again one day. Take care and please know you have all touched my heart. I have a beautiful grand-nephew named Benjamin who is 10 months old and having his 6th surgery on Monday. Here's hoping that he and Luca can meet in college and become friends.